Joe Boske. Pic:- Mike Shaughnessy. He grew up loving outdoor pursuits and the natural world, despite living close to the world’s largest car manufacturing plant. He has lived in Ireland most his life, but his interest in the country was stimulated in part through British Army radio. There has never been anything conventional about artist, graphic designer, and musician Joe Boske, whose iconic posters and surrealistic depictions of the west of Ireland landscape have been collected in a wonderful new book, Joe Boske The Works, published by Letterfrack based company Artisan House. The Works is a collection of the paintings, posters, album cover designs, illustrations, and logos created over the last 44 years by the German born, Clifden based, artist. It also includes writings by Joe on his childhood as well as poems and reflections; an essay by Máirtín Ó Céidigh; Joe’s Galway Advertiser Proust Questionnaire; and tributes to the man by The Waterboys’ Mike Scott and the late Dermot Healy, among others. The book received its official launch during the Clifden Arts Festival, where its limited edition version (which included a DVD and Joe’s 1997 album Amara ) sold out. The book receives its Galway city launch in Charlie Byrne’s Bookshop on Saturday December 6 at 3pm. The guest speaker is cartoonist Tom Mathews. So how did the publication come about? “I know Vincent Murphy and Mary Roddy, who founded Artisan House, for a long time,” Joe tells me during our Tuesday afternoon interview. “I went to their inaugural book launch and while there Vincent got talking to me and asked would I be interested in doing a book? I said ‘Yes please!’, so we did! Joe was born in Vorsfelde, Lower Saxony, in what is now central Germany, but back then was the eastern regions of West Germany, close to the border of the German Democratic Republic. Despite the political situation Germany found itself in, the Boske household was a happy one where creativity and a love of the outdoors was actively encouraged. That was in 1969 and Joe has been here ever since. 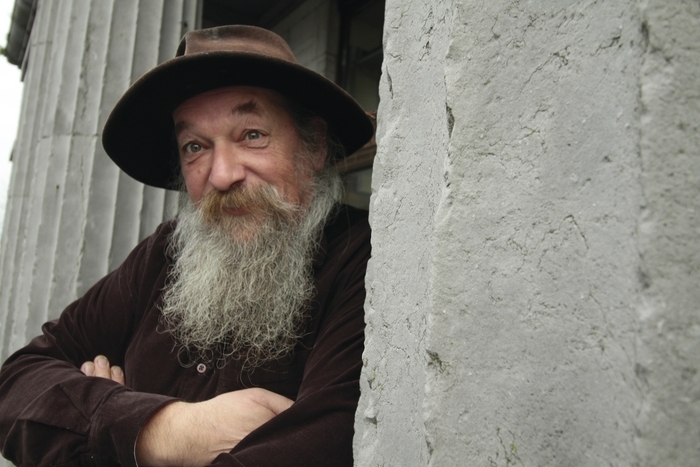 For more than 35 years, Joe has become one of the major figures in the Galway arts scene, and was involved, along with Ollie Jennings, Ted Turton, and Mary Coughlan, in getting the Galway Arts Festival up and running in 1978. It was through the Galway Arts Festival that Joe established his iconic position with Galway art, designing the unforgettable posters for the 1984, 1985, 1986, 1990, 1991 (pictured above ), and 1992 festivals (many of which are included in Joe Boske The Works ). However with digital media, is the poster still a viable form? Joe Boske The Works is a wonderful collection of Joe’s art, showcasing his detailed, surrealist style, uilt around a personal iconography that is distinctly and unambiguously Irish, without ever lapsing into clichéd images about the country.